It is a cold working process, meaning the metal retains its ductility and tensile strength because it is not heated during forming. The finished products are round in cross section, lightweight and have a very smooth exterior and interior surface finish. Shear Spinning – Acme Metal Spinning Inc.
Like flow formed parts, shear spun products never require welding and are formed out of one preformed part called a blank, which is a flat piece of metal. The metal can either be punched with a hole in its middle, or it can be left completely solid. In the former case, this would result in a spun metal product with two openings – one above and one below. In the latter case, the spun product would feature only one opening. 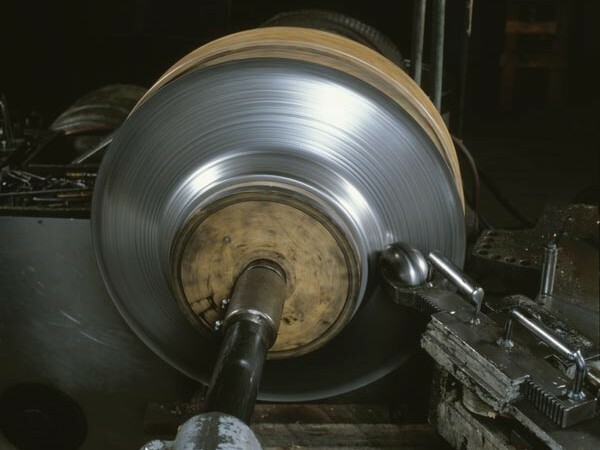 Many different metals can be shear spun, including aluminum, steel, stainless steel, copper and titanium. Common shear spun products include rocket hose cones, gas turbine engines and dish aerials. The heating, cooling, architectural, food and beverage, agricultural, chemical and lighting industries also use the cone-shaped metal products that are formed by shear spinning. The shear spinning process starts with manufacturing the blank, which is a preformed part made by deep drawing, stamping or press forming. It is a flat piece of metal that is engineered to ensure there is exactly enough material to form the final shape’s dimensions. The blank is then sheared by rollers over a rotating mandrel. Higher force is needed from the spinning machine during this process in comparison to standard metal spinners. While the diameter of the blank doesn’t change, the thickness decreases depending on the angle of the mandrel and the gap between the rollers and the mandrel. This differs from standard metal spinning, where the thickness of the blank does not change. The wall thickness of the part is customized to certain stress requirements. The finished product has smooth interior and exterior surfaces without any secondary manufacturing processes, including additional buffing, shining or polishing. No welding is needed during shear spinning and very little scrap metal is produced since the part is formed from a single blank. Different metals have varying degrees of spinnability, or the ability to undergo shear spinning without reaching maximum tensile strength. Shear Spinning Shear spinning is a form of flow forming that produces conic or contoured, hollow metal products that have a uniform or purposely varied wall thickness.